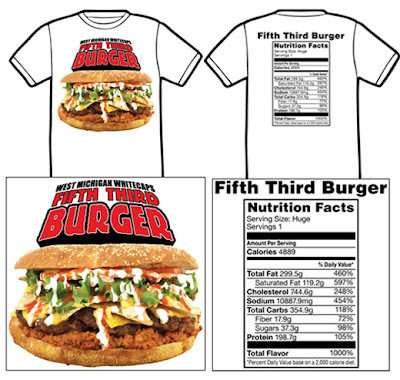 The Class A West Michigan Whitecaps have added the following gastronomic monstrosity to their ballpark menu: the Fifth Third Burger. 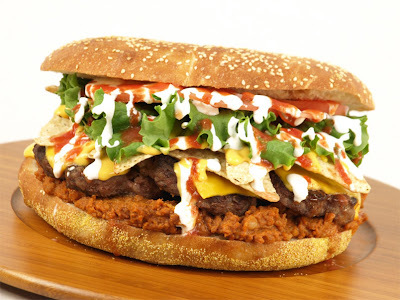 A heart-stopping (perhaps literally) 4,889 calories of beef, lettuce, tomato, salsa, sour cream, chili and Fritos on an 8-inch sesame seed bun. Total weight: nearly 30 ounces.